Rumours are rife that Spanish champions Atletico Madrid wish to fill their Diego Costa-shaped void with Manchester City striker Alvaro Negredo. Shock, horror and disbelief could be a few of the emotions City fans – who can comfort themselves with their 7/4 favouritism to retain the title – would feel in reaction to seeing the man they quickly dubbed ‘beast’ being sold off only one season after joining the club. This would be understandable too, seeing as the former Sevilla man cost somewhere in the region of £20m and then went on to bag 23 goals during a memorable debut campaign at the Etihad. However, everyone has their price and if City can recoup either the £20 odd million they paid for Negredo’s services or, ideally more, then it would be in their interest to sell him. 23 goals tells its own tale, but it doesn’t explain that the Spaniard played his way out of his country’s Wolrd Cup squad after failing to find the net past January 21. 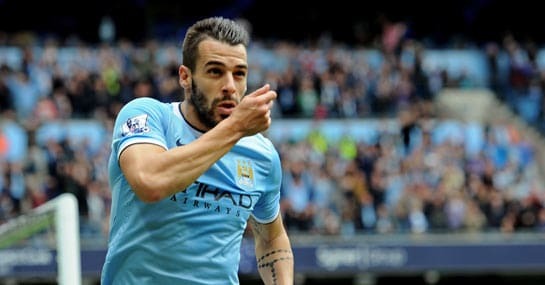 By the time the curtain is hoisted on the new Premier League season Negredo will have entered his 30th year. The man mountain made the Etihad his own goal-grabbing fortress, but it’s got to be a slight concern that only two of his nine league goals arrived away from home and only five in total. Ever since joining from Wolfsburg the Bosnian has had to make do with playing second-fiddle to others. However, 16 Premier League goals last season and many of them in crucial games in the run-in showed he’s the king of City’s target men. On a similar note to Negredo being a striker of too similar ilk to Dzeko, City being able to call upon a rejuvenated Jovetic has a massive bearing. The Montenegrin offers a much different option to Dzeko and if Negredo left, there would be more room for a young talent to supplement the remaining trio of front men.